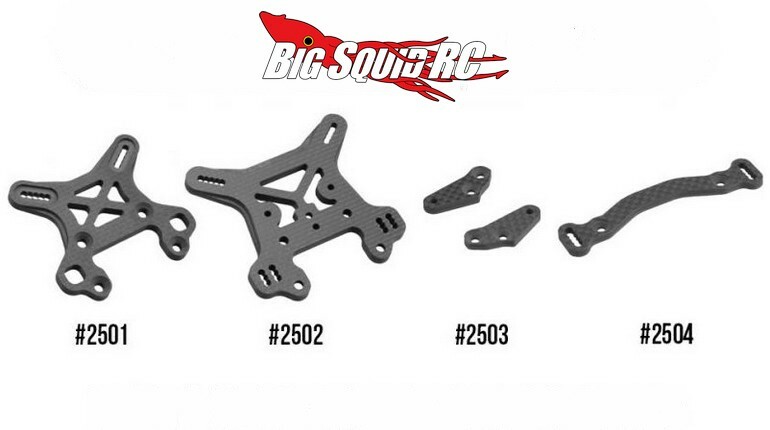 JConcepts Carbon Fiber Upgrades For The RC8B3/B3E « Big Squid RC – RC Car and Truck News, Reviews, Videos, and More! New for all you Associated RC8B3/B3E owners are a handful of Carbon Fiber Upgrades from JConcepts. The carbon fiber goodies are light, strong, and very trick looking. First up is a Front Shock Tower. The tower is made from 5mm thick carbon fiber and features the stock geometry. Pricing is $30 and it has a part number of #2501. A Rear Shock Tower is also coming soon. The rear tower is also made from beefy 5mm thick carbon fiber and has reinforcement ribs where needed. The rear tower is priced at $35 and it has a part number of #2502. JConcepts is also making carbon fiber Steering Arms. The steering arms are symmetrical in design and are made from 3.0mm thick carbon fiber. The steering arms have a part number of #2503 and are priced at just $12. Last on the list is a Steering Rack. The JConcepts steering rack has five different holes for ackermann adjustment and comes with countersunk holes where needed. Pricing is just $11 and it has a part number of #2504. You can find full details on all the above mentioned parts At This Link on the JConcepts website, or you can Click Right Here for more JConcepts news on BigSquidRC.